Its a rainy Monday afternoon peeps! Nice and cold perfect to take a break from the hot summer. 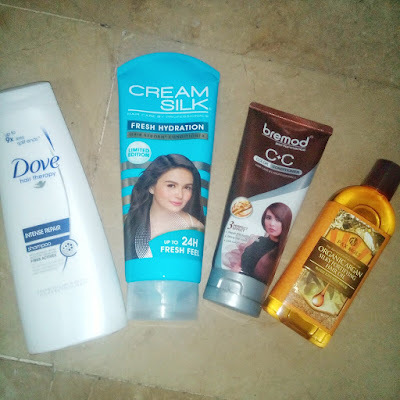 For today I thought of sharing the new hair essential products I use for the start of April. Although I have bleached hair I only kept basic hair products because I don't really put in too much time into preparation daily and I believe too much product makes my hair sticky. So here are my current hair buddies this April! I also used hair spa products and overnight virgin coconut oil for added moisture. Cleanses well and lathers well as well. However its not really the perfect shampoo for bleached hair. I am looking for a sulfate free shampoo. I was sold with the word 'limited edition!' So far it lives to its 24 hours fresh scent. An in depth review coming up soon. This makes combing and ironing so much easier! Okay so that sums up our post for today. Here is a playlist of KZ Tandingan's breath taking performances .